Exotic fresh fruits were rare in the Soviet Union, which ironically may be why they factor so heavily in the Book’s illustrations. Walking past the numerous fruit and vegetable stalls of Tbilisi, I couldn’t resist the urge to make something with the beautiful local peaches. 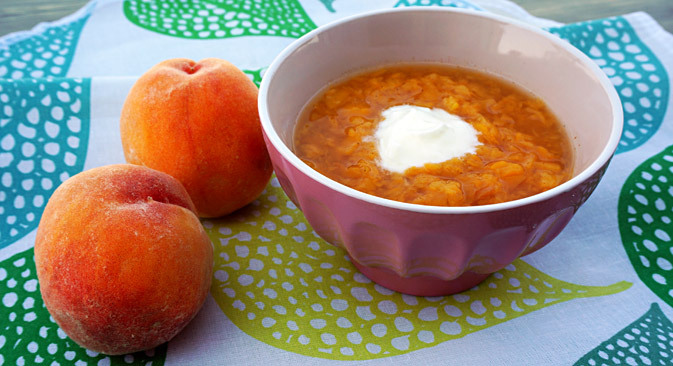 The recipe I found in the Book is called “peach soup” – odd but possibly good, I thought. I always had a thing for peaches growing up. I just loved how sweet and juicy they tasted, and was always excited to have a good one — at a beach at the Black sea or occasionally even in Moscow. I remember dreaming of going on a diet made up entirely of fruit. An Australian friend once asked me: “why do people always bring fruit when they visit someone at a hospital? Why is fruit such a big deal?” Discovering that this was a strange concept to an Australian made me realize for the first time that Russians do indeed have a slight (huge) fruit obsession. When I was a teenage and, naturally, on a mission to spend as much of my mother’s hard-earned cash as possible, she would convert the price of some clothing item I considered a good deal into its banana equivalent: “You know you could get 3 kilos of bananas with this money!” she would say. When my mom was growing up, bananas were rear and expensive, and the words “basket of fruit” sounded like “pile of gold” to her.